Ethan has salmon for his meals almost every week. If I can help it, that is. 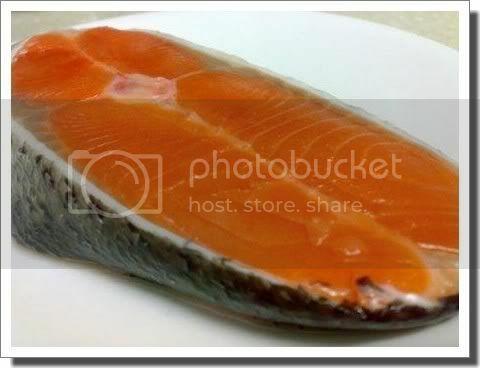 Apart from the DHA goodness, fish is certainly good stuff for growing kids, what more salmon! Of course, he will still get some pork and/or chicken with his meals at the baby sitter’s, so the salmon is just the icing on top of the cake, figuratively speaking. He gets his salmon steamed…. psst… I have yet to train him to take it raw a la sashimi style, but that will come later. Kekeke…. Worms, Bears and So Much More! Joyce says: Well, now you can have all the salmon you want in any way you want it eh? I love salmon too. Tried with Hin Lerk long time ago, he didn’t like it. Maybe time to try again. Ian used to have it 2-3 times a week for poridge but now he doesn’t like porridge, fussy… and when I cook the whole house smells of fish..hehe..
Joyce says: Perhaps you can try serving it with rice? Or you can use cod instead of salmon – it tastes good too. Salmon is wonderful. I can hardly go a week without it myself. Joyce says: Ethan is just like you. Good for Ethan, especially steam salmon. Charlotte didn’t like any steam fish, but I’ll hv better chance to get her eat fish if it is fried. Yes, salmon is very good and glad Ethan loves it. Keep it up…. I had plenty of salmon when I was preggy with Darrius. i notice block like this has little bones…did u notice any? Joyce says: Come to think of it, you’re right! There were hardly any bones. Last weekend, I bought cod and there were no bones on that one!